Long ago, before history broke in half, elder gods exiled the vengeful deity Erynis to a far corner of Earth. 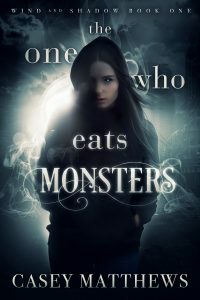 When Ryn is found weakened after saving the life of an innocent villager, the U.S. military mistakes the battered immortal for a feral teenager and places her in New Petersburg, a decaying city full of monsters. In her clash with the city’s demons, Ryn is confused by her intense emotional connection with Naomi Bradford, a senator’s daughter she has sworn to protect. But while her claws can kill anything that dies (and a few things that cannot), she must also contend with the human race. They lie, they speak in riddles, and to protect her friend, the immortal must navigate the senseless rules of their flawed civilization. Worse, they are fragile—and giving her heart to one makes Ryn afraid for the first time in her eternal life.